Dramatically increases the value of equipment for the secondary market. Provides data critical to maximizing capital recovery of Canon photo equipment. Locate buyers quicker, potentially eliminating costs and inconveniences associated with unsold tools. 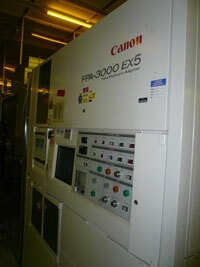 SERVTECH offers many services that extend the useful life of Canon photolithography equipment. But when it comes to optimizing the market value of our client’s capital investments, we provide a genuine advantage that exceeds that of the equipment brokers or agents in the used semiconductor equipment industry. By partnering with SERVTECH either before, or at the time a tool is scheduled for de-commissioning, we are able to provide services critical to maximizing market value and capital recovery. SERVTECH will provide complete system audit and data reports that are critical to the successful sale of used Canon lithography tools. As both buyers and sellers of secondary market equipment, we know the real value in this information and will provide data and reports in an easy to use format, giving potential buyers exactly the information needed to make confident purchasing decisions. We will also use our worldwide network to focus on finding buyers for these tools before the systems are to be de-installed. By doing so, we are often able to defer costs associated with rigging and crating to the buyer, and potentially eliminate any costs and inconveniences associated with storage of an unsold tool. At the client’s option, we can also use this audit data to make recommendations to optimize tool performance, bringing it into OEM specifications or eliminating problems which might be obstacles for potential buyers. There are no labor charges for the collection and production of these reports, and any incurred travel expenses will be deducted from the invoice when de-installation services are performed by SERVTECH. Choose to allow SERVTECH to exclusively represent the equipment in the secondary market, utilizing our worldwide network, and we will wave all travel, labor and de-installation costs associated with the decommissioning of the tool. Either way, the end result is zero net cost for these services. Not only will this program dramatically increase opportunity to find buyers, but they are likely to increase the value of these tools in the secondary market by tenfold, maximizing true capital recovery by hundreds of thousands of dollars. Be sure to contact us today to discuss how SERVTECH can help maximize the capital recovery or your Canon photolithography equipment.